I love this picture. Kevin Hanna is a very talented artists and I really like her work. Her creations are colorful, playful, and very imaginative. 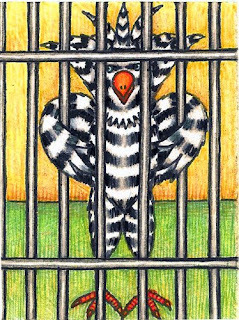 I hope to create another jailbird at the end of the week. I’m going to court on August 7th to testify against my attacker. He came after my coworkers and me a few months ago and tried stabbing us with a shank. It’s a toss up whether I’ll have my day in court. The court date has already been postponed twice. I’ll keep you posted. A great picture! Just right! Wear the dress with the pearls, the one you posted of yourself. It is subdued elegance. When you speak, look directly at the jury, not the law team. You are speaking to the twelve people seated in the box. Give them a front row seat. Speak from you heart. I wish you the absolute best outcome, the best outcome for society. I hope he rots in jail. Sorry, I can't get any less specific than that. I know you communicate well and the jury will hear you loud and clear. Phone line is open if you need to ventilate! Gosh I didn't realize you'd been attacked. With the way our system is, it usually seems slanted again'st the innocent. But I know you will come across loud and clear and this Slime will be put away..